What are the most effective NLP techniques and patterns? Michael has delivered top quality NLP training for years. 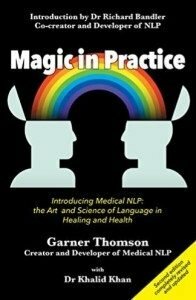 Here are some of the many NLP techniques and exercises he has discovered from a wide range of sources. Remember, NLP is often more about the development of techniques which come from attitude and modelling than the techniques themselves. The following books by NLP co-creator, Richard Bandler, are excellent for the latest NLP techniques (all links open in a new window). This list gives you an idea about the wide range of NLP techniques available, the links on the items below are currently unavailable, the links on the right hand side all work. Details of the majority of techniques are available from the books above or from the links on the right hand side. We all need a certain amount of stress to keep us healthy. However too many stress chemicals can damage the brain. The art is to develop the ability to let go of excess stress. This is an excellent list of Beating Stress Exercises by Richard Bandler and Owen Fitzpatrick. Richard’s classic approach to Belief Change, in this case to become an excellent learner. Changing Feelings by Dissociation is a technique to reduce unpleasant feelings by dissociation and submodality change. Play is an aspect of NLP training and many NLP techniques. According to Johan Huizinga, play is a way of getting in touch with, and living out, the most essential and unique parts of ourselves. See Characteristics of Play. Collapsing Anchors is an effective technique to lessen or remove the impact of an unwanted anchor. Embedded Commands are commands that have been softened by embedding them in a particular sentence. This means that they are less likely to be noticed and it’s more likely that the client will follow them. Asking good, empowering questions (1) is important in many aspects of NLP. In this technique we’re using good questions to direct attention towards useful states, resources and actions. Empowering questions (2) is a more advanced version. The Fast Phobia Cure can be used for any real big fear. If the fear can be tested there and then – i.e. purely imagining the situation brings observable manifestations of the fear – so much the better. Feed-forward is an approach developed by Marshall Goldsmith to make it easier for us continually to improve what we do. It also overcomes the challenge that we’re not to keen on either taking or giving feedback. See Feedforward. Foolproof planning is a way to plan by thinking of how you will be when you’re totally on track, and then working backwards to the present – so that you can then do it forwards. Future Pacing is a powerful way of mentally rehearsing future events; both to improve your performance and how you feel about completing them. Getting things done is a technique to reduce or stop an emotion that’s currently blocking you – so that you can easily get things done. The Gratitude Inventory shows you how to become more aware of what you have to be grateful for. This leads to a positive benefit to both health and happiness. Logical Levels can be used as an approach to explore any outcome. This may produce a congruent way forward, or it will give information about where to go next. Making Difficult Decisions is a simple technique for making decisions. It ensures we give enough attention to every detail. The Meta Model was the first major NLP language pattern series. It helps you to ask clean questions to explore your ‘Map’ and raise issues that were unconscious. The model needs to be used with respect. This is a great exercise for reducing anxiety and for balancing the brain hemispheres. See Mind Juggling. In some ways, modelling is the key skill in NLP. Would it be useful if you could pick up others’ skills? This NLP technique uses ‘strategy elicitation’, ‘logical levels’ and ‘true” NLP modelling. NLP Presuppositions are not a technique as such but are useful beliefs for NLP and coaching. The emphasis being on useful and pragmatic rather than true. Well formed outcomes help you think about what you want in such a way that they become easier and more fun to achieve. Alternatively, they may help you realise that you actually want something very different. Richard now talks in terms of direction rather than outcomes. This overcoming overwhelm process helps you to pace the client and lead them to a resourceful state where they can take responsibility and where you can help them set positive outcomes. Perceptual positions is a useful technique to understand someone else’s point of view. Planning to succeed is a powerful visual technique to help you plan an empowering and successful future. Progressive dissociation is a slightly bizarre technique that can be used for curing headaches and similar discomforts. The relaxation response is a powerful meditative technique. Six step reframing is gentle and respectful technique which can be used for any behaviour change. It is gentle and respectful in that any answer or solution doesn’t come from the practitioner’s or the client’s conscious mind – it comes from the client’s unconscious mind. Stalking is a fascinating NLP technique to calibrate your client to notice when they are just getting into ‘non-useful’ state, such as being over tired or exhausted – and when it’s still early enough to do something about it. State elicitation and anchor enables your client to access a useful state and then re-access it in the future. Remember anchoring is easy if you have a strong state. The real skill is in eliciting strong and powerful states. These are very powerful exercises to lead you into great states that will empower you in all aspects of life. See Success State Exercises. Swish can be used to change a simple behaviour or a future state, for example feeling good when going on stage. It’s really a more formalised way of doing a sub-modality change and linking it to a point in the future. Timeline is a way of exploring challenges and opportunities from different perspectives of time. It can be easier to come up with a plan to meet a challenge or opportunity from a perspective in the future when it has already been solved. It can be easier to resolve an issue which happened in the past from the perspective of going back to that time. This is a highly recommended and brilliant adaptation of the the original ‘Visual Squash’ technique. The new Visual Squash is for goal setting. Walking state is a technique that enables your client to prepare and rehearse for a meeting. It will have a far greater positive impact on the result than the majority of rehearsal approaches. It will also introduce the concept of the huge choice of useful states available to all of us. 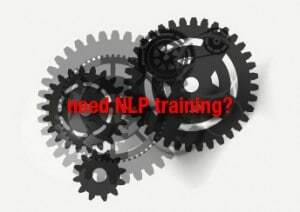 NLP Video 2 | What is NLP?